Both "Data Analyst" (DA) and "Data Scientist" (DS) are titles that vary greatly between industries and even amongst individual organizations within industries. As the roles behind titles change over time, it is natural for some teams to ask themselves the following questions: should we have distinct roles or just stick to one? How would we differentiate the roles in a way that fulfills our organization's needs and is generally consistent with similar organizations? Do we want to consider a DS to be equivalent to a Sr. DA, the only difference being the title? Answering these questions not only establishes clear responsibilities and expectations, but enables hiring managers and recruiters to communicate clearly with potential applicants in the future (in job postings, for example). 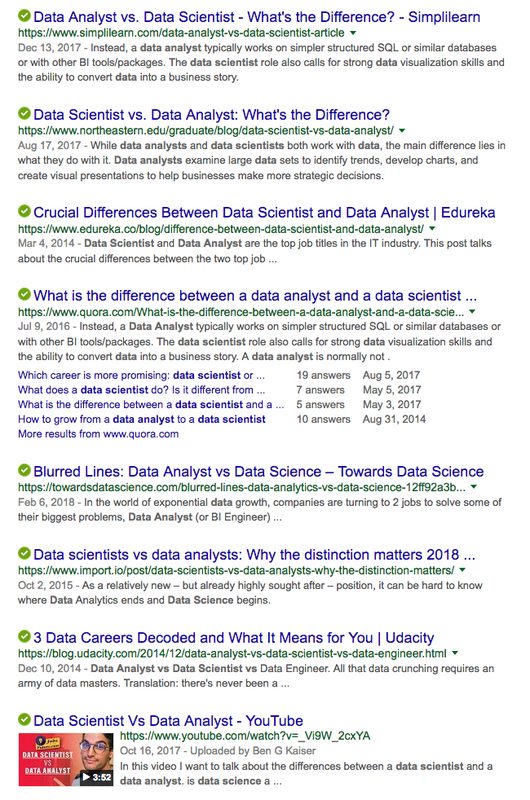 Search the Internet for "data scientist vs data analyst" and you will find plenty of people who don't know what the difference is (nor if there even is one anymore), and you will find plenty of people who think they know the definitions and differences. You will find an abundance of opinions but very little consistency! When I asked my followers on social media what they personally think the differences are, not everyone shared the same opinion but some interesting camps of thought emerged. In summary: the kinds of questions that a DA can answer and the kinds of tasks a DA can work on are a subset of DS’s because GUI tools limit what can be done, but a DS – by knowing programming – can answer way more kinds of questions and work on way more kinds of tasks. DS, Operations provides data & insights for resourcing decisions through ad-hoc analyses, dashboards, defining KPIs, and A/B testing. DS, Product delivers data science as product (and not to be confused with Data Scientists in Product). These folks build predictive models, AIs, matchmaking systems. DS, Research experiments and innovates. Not everything they work on ends up in production or utilized, but they are free to be creative and take chances. I hope for some that this is an eye-opening moment and that they now realize that there's no single distinction everyone agrees on. Everyone is coming into it with their own backgrounds, experiences, thought processes, and ideas. None of these are wrong! So if you're in a hiring position, please remember to be specific when writing a job description. You can't just write "Data Analyst" or "Data Scientist" at the top and expect everyone else to share your assumptions, it's a recipe for misunderstanding and failure. I would like to thank everyone who responded, and especially Emily Robinson and Renee M. P. Teate. Thank you everybody for taking the time to write and in some cases discuss nuances in spun-off threads! If you want to explore all the replies yourself, here's root. I would also like to point out that is not even representative of how data professionals perceive these roles globally. All of the responses were from English-literate people, most (if not all) of the responses were from people living and working in U.S., and many of them are specifically people who follow me on Twitter. I know for a fact that there are so many more data professionals (data engineers have opinions on this too!) who aren't in any of those groups. These are professionals who have their own perceptions, who operate in different cultures, under different expectations all across the world, and someone out there is probably writing a similar post within their own community. "I'm currently learning visualisation with R/ggplot2 and was wondering whether you could share tips/links/videos/books/resources that helped you in your journey"
In each case I distinctly remember wanting to express an idea in a specific way and had to learn something new or learn how to think about a problem in a new way. If you click on one of those, you will see a link to its source code on GitHub that you are welcome to look at and learn from. …and many more! There are a lot of folks sharing their knowledge and techniques out there, and I cannot stress enough how many of them you can find out by going through Mara's exhaustive catalogue of cool things made by people in R.
Do you have any recommendations for learning statistics on budget? Do you have advice for graduates applying for data science jobs? So I've gone back and added the new "Ask Popov" tag to those. Hopefully there will be more questions because these advice posts feel good to write! Getting into a technical field like data science is really difficult when you're fresh out of school. On the off-chance that your potential employer actually gets the hiring process right, most organizations are still going to place a considerable amount of weight on experience over schooling. Like, yeah there are certain schools that make it a lot easier to go from academia to industry, but otherwise you're dealing with the classic catch-22 situation. Explore it: Once you have a dataset that actually excites you, you should perform some EDA. Produce at least one (thoroughly labeled) visualization that shows some interesting pattern or relationship. I want to see your curiosity. I want to see an understanding that you can't just jump into model-fitting without developing some familiarity with your data first. Analyze it: You're going to lose a lot of interest if you just show and talk about how you followed the steps of some tutorial verbatim. If you learn from the tutorial and then apply that methodology to a different dataset, that's basically what "experience" means. And don't try to use an overly complicated algorithm/model if the goal doesn't require it. 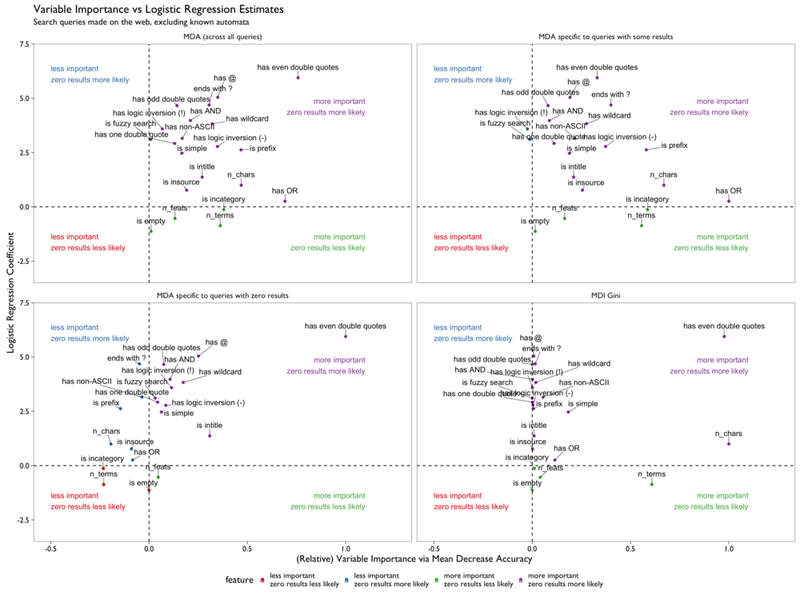 You might get incredible accuracy classifying with deep learning, but you'll probably have a more interesting story to tell from inference with a logistic regression. Heck, at Wikimedia we use that in our anti-harassment research. Present your work: It can be a neat report with an executive summary (abstract) or it can be an interactive visualization or a slide deck. Just something better than zip archive of scripts or Jupyter notebooks. Explain your work (however complex) and results in a way that can be understood: This is where the first point is really important. If you're describing your analysis of data from a topic you're familiar with and are interested in, you're going to have a much easier time explaining it to a stranger. Be prepared to talk about it to a non-technical person. Be prepared to talk about it to a technical person who may not be familiar with your particular methodology. 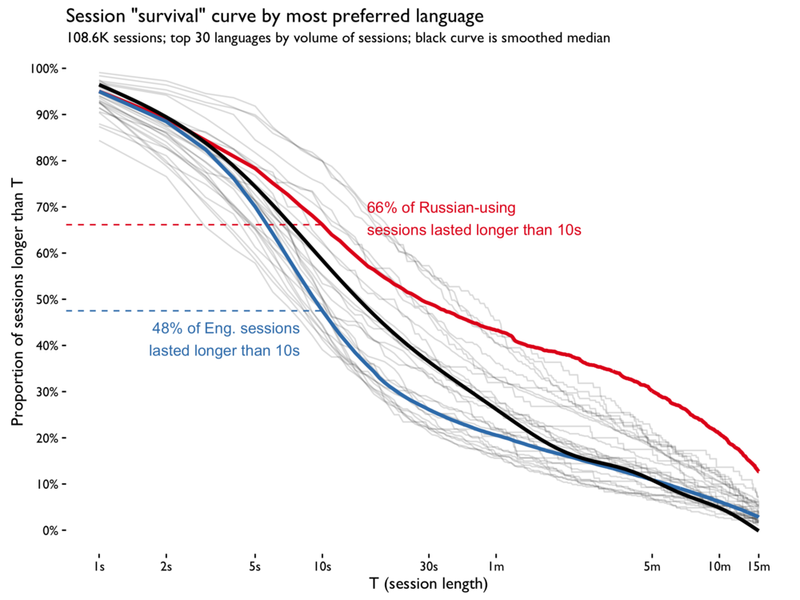 Your interviewer may have done a lot of computational lingustics & NLP but no survival analysis, so get ready to give a brief lesson on K-M curves (and vice versa). Perform an analysis from start to finish: Because that's what we look for when we assign a take-home task to our candidates. A lot of times the job postings will include a number of years as a requirement, but that's not as need-to-have as you or they might think. Secretely, it's actually a nice-to-have because "experience" is mostly a proxy for "candidate has previously used real data to solve a problem in a way that can be understood and used to inform a decision-making process." If you don't have experience, you can still demonstrate that you've done what a data scientist does. Acknowledgement: I would like to thank Angela Bassa (Director of Data Science at iRobot) for her input on this post. In particular, the last paragraph is based entirely on her suggestions. She also created the Data Helpers website that lists data professionals who are able to answer questions, promote, or mentor newcomers into the field. In the past year or two I've had several friends approach me about learning statistics because their employer/organization was moving toward a more data-driven approach to decision making. (This brought me a lot of joy.) I firmly believe you don't actually need a fancy degree and tens of thousands of dollars in tuition debt to be able to engage with data, glean insights, and make inferences from it. And now, thanks to many wonderful statisticians on the Internet, there is now a plethora of freely accessible resources that enable curious minds to learn the art and science of statistics. First, I recommend installing R and RStudio for actually using it. They're free and what I use for almost all of my statistical analyses. Most of the links in this post involve learning by doing statistics in R.
There's Data Analysis and Statistical Inference + interactive companion course by Mine Çetinkaya-Rundel (Duke University). She has also written the OpenIntro to Statistics book (available for free as a PDF). Phew! Okay, that should be enough. Feel free to suggest more in the comments below.